Goals from Terry Brisley, Colin Garwood and Joe Laidlaw helped Pompey to victory over lowly Halifax Town at Fratton Park. A crowd of 14,087 watched the match. Pompey were always in control and once Brisley rifled in his 10th goal of the season on 29 minutes it was always a question of how large the margin of victory would be. The Blues tightened their grip with a strike by Garwood on 58 minutes and Laidlaw flashed his 100th league goal past John Kilner from an Alan Rogers corner in the 72nd minute. Franny Firth pulled a goal back for Halifax three minutes later. Southampton produced a storming finish to beat Stoke City at The Dell. With three minutes to go and with the score at 1-1, Mick Channon put Saints ahead with a low shot and then Phil Boyer headed in Channon’s cross to make it 3-1. Goals by Peter Ward and Ray Clarke gave Brighton a 2-0 win over Derby County at the Goldstone Ground. Manchester United remained a point clear at the top of division one after beating Tottenham Hotspur 2-1 at White Hart Lane. Liverpool’s 4-0 home win against Middlesbrough kept them second. Second Division leaders Chelsea beat Preston 2-0 at home while second-placed Newcastle United defeated Fulham by the same scoreline at St James’ Park. Sheffield United won 2-0 at home to Plymouth Argyle to stay top of Division Three. AFC Bournemouth drew 0-0 at home to Peterborough United in Division Four. Kevin Albury scored the only goal as Fareham Town beat Chelmsford in a Southern League clash at Cams Alders. The scores were level at the interval with Gosport having the better of the first half. 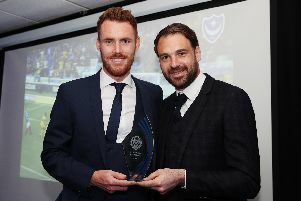 Colin Garwood, one of the goalscorers in Pompey’s win against Halifax Town, was the subject of a proposed move to Exeter City. But manager Frank Burrows said that the money received for Garwood would help pay for Bury’s Dave Gregory. Burrows considered Joe Laidlaw had recently lost a bit of sharpness and so ordered the midfielder to lose weight.